Disclaimer: The Jomo Audio Trinity sent to us is a sample in exchange for our honest opinion. We thank the team at Jomo Audio for giving us this opportunity. Watch this space because along with AAW/Shozy, Aclair, LZ, and Noble Audio to name but a few, the rise of the ‘electrostatic’ tweeter in monitors is upon us in 2019. I am expecting a lot more companies to showcase this hybrid type design in the months to come making for a very interesting new development in IEM sound signatures moving forward. We have a few here already in testing and the sound signature is quite different to regular BA and even previous dynamic/hybrid iterations that previously held sway in the market. Since Sonion launched the tweeter design last year a lot of companies have embraced them to get new gear to the market. 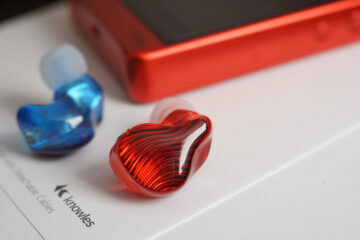 You could argue that first early birds to the market get the “worm” and that’s what Jomo Audio is all about with their new Trinity hybrid IEM priced at SG$3,799.00 or approximately $2790 US. The tech is not cheap so for now, you are going to be paying a premium price. 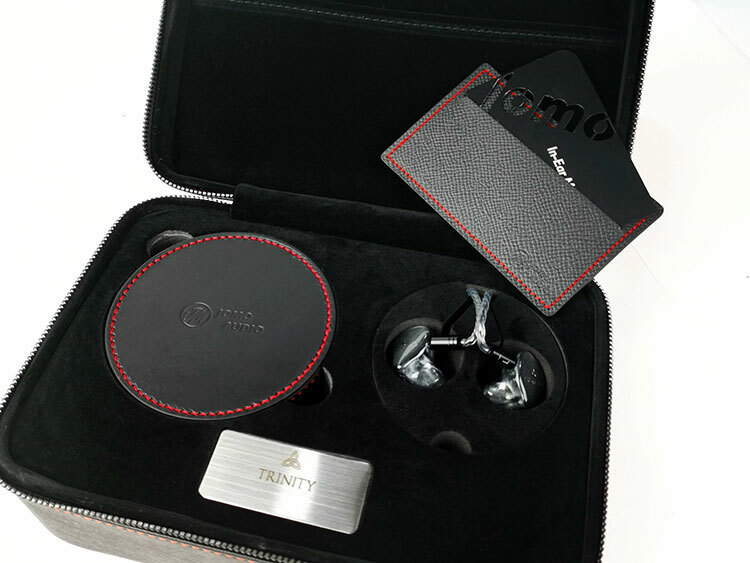 Given the premium price, it is no surprise that the Trinity, in its universal format, is the flagship monitor of the Jomo Audio range for 2019. It has pipped previous headliners such as the custom Flamenco by a few 100 Singapore dollars. I would suspect that a custom version of the Trinity could cost even more. That being said, it is not the most expensive monitor out there with the likes of the Layla and 64 Audio’s A18/Tia Fourte priced a bit higher and of course, the AMT powered oBravo Ra far higher. What it does confirm though is that the gradual move away from the driver count race is all but complete. The Trinity is not a double-digit driver creation giving credence to the price being linked to the implementation and work done on integrating the new electrostatic drivers. 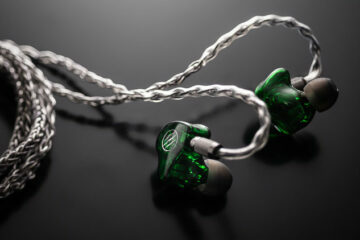 There are 7 drivers in total with a single 8mm dynamic driver for the lows, 4 balanced armature drivers for the mids and highs and 2 electrostatic super tweeters. All are connected with High purity SPC internal Litz wiring. Like any electrostatic driver, it needs a specially designed electrical current system so these two drivers use a micro-sized internal transformer unit to power them. All drivers are integrated using a 4-way crossover network with Jomo Audio’s proprietary Cross-Sync Uniphase crossover network. This allows Jomo to obtain a very precise level of phase control over very different types of drivers using a combination of electrical and acoustic filters. 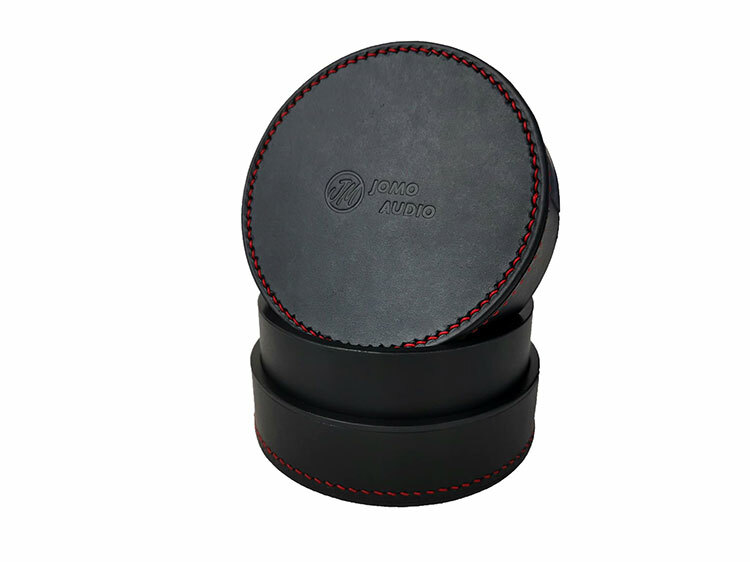 Just to avoid some confusion we do need to quickly point out that Jomo Audio is using full electrostatic design super tweeters and not piezoelectric alternatives found in the Noble Audio Khan and the LZ A6. These are two different types of tweeters though they both rely on the piezoelectric effect in order to function. The main difference between the two is that piezoelectric transducers use a ceramic material whereas electrostatic transducers contain a thin metal membrane. 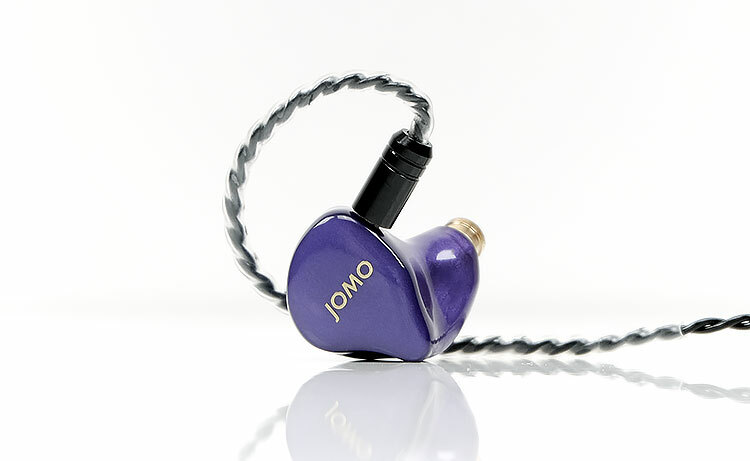 I get a feeling Jomo Audio love a bit of purple and blue in their shell mixes. I have had a few Jomo Audio custom stuff arrives through my door in the last few months where I said to Joseph to just “let rip” and they arrive with shades of purple. A Prince fan perchance? 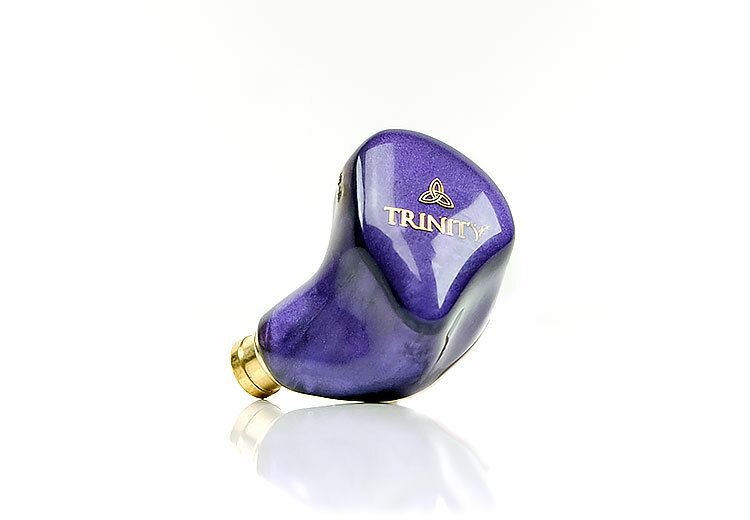 In any event, the Trinity is an attractively designed “custom universal” acrylic shell and faceplate 2-piece design with a choice of two nozzles, brass or a stainless-steel alternative. Now the choice of nozzles is important because the two versions measure slightly differently. We do not have the SS option here to confirm but in our discussions with Jomo, they do indicate that the SS version is a little cleaner and slightly more neutral sounding than the warmer bassier brass version. For your reference, the one in the pics is the brass version and you can tell because the nozzle has a more ‘golden’ hue to its finish than the silvery stainless-steel nozzle. So back to “custom universal”. Jomo started using this increasingly popular form factor design with the PLB and then perfected it with the Haka early last year. Other companies aggressively perfecting this design include the likes of iBasso, qdc, ARC, and InEar of Germany to name but a few. As Jomo Audio are audiologists by trade it is no surprise the company has adopted and mastered the ‘art of the good fit’. Generally, custom universal designs are supposed to be a level of contouring on a shell that best represents the typical curves and ridges of the typical human ear. Who better to understand what that means than a company that takes ear impressions on a daily basis. Compared to the Haka and the iBasso IT04, the Trinity curves are there but not quite as extreme in the contouring. I would presume due to the need to accommodate various different driver sizes there was a physical limit to how deep they could recess the shell in parts. In any event, the Trinity custom universal is somewhere between their PLB shape and the aggressive Haka contouring. The Trinity is terminated at the top of the shell with a set of 0.78mm 2-pin flush sockets and is designed to be worn ‘over-the-ear’. The cable male pin barrels are actually a bit on the large side but fairly easy to grip. The pin connections are not super-stiff to insert or get out but they do create a solid contact and will not slide out either. The stock cable is not a Plastics One variant despite having some comment visual aesthetics. Jomo has commissioned a custom design that is slightly thicker than the P1 cables with a tighter braided weave compared to the twisted look of the Plastics One build. The cable is a 1.2m 4-core SPC Litz wire wrapped in a fairly light PET jacket. This wiring precisely matches the internal wiring used by Jomo which is also SPC Litz and nice to see from a holistic perspective. The cable is terminated with a small 3.5mm TRSS gold-plated right-angle jack with decent strain relief and uses a small black Jomo-branded barrel at the Y-split. There is some sizeable memory wire management at the connector side. The type is more bend and snaps back into shape than user-shaped. It will not twist and manipulate like some other memory wire alternatives. It also adds a little girth to the wire which people wearing glasses might want to be aware of. Physical noise on the wire (microphonics) is quite low and it is a fairly pliant cable overall. I did notice that there is a degree of memory retention in the cable though not much. Some small kinks and bends were showing during use. The Trinity is a reasonably small universal monitor for fitment purposes. The body is a little deeper than the Khan with a shorter nozzle and certainly a bit smaller than the competing AAW/Shozy Pola. The contouring of the Trinity does a nice job of allowing it to settle in the ear without any undue pressure. I give a slight edge to the Haka’s more aggressive contouring for supreme comfort but the Trinity is not far behind. The Haka is a smaller IEM also which does help a little. 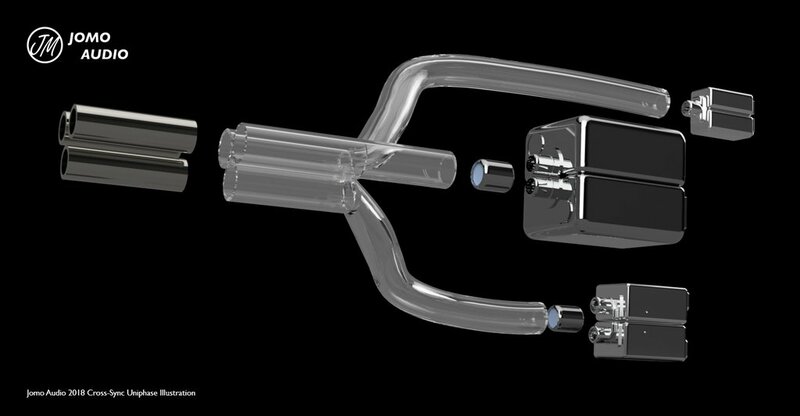 The Trinity contouring also allows the nozzle to creep into the ear canal a little further than you might think. The body shape leading to the brass nozzle is quite wide but stubby so there is a fair degree of emphasis on the tips producing the final part of the seal. 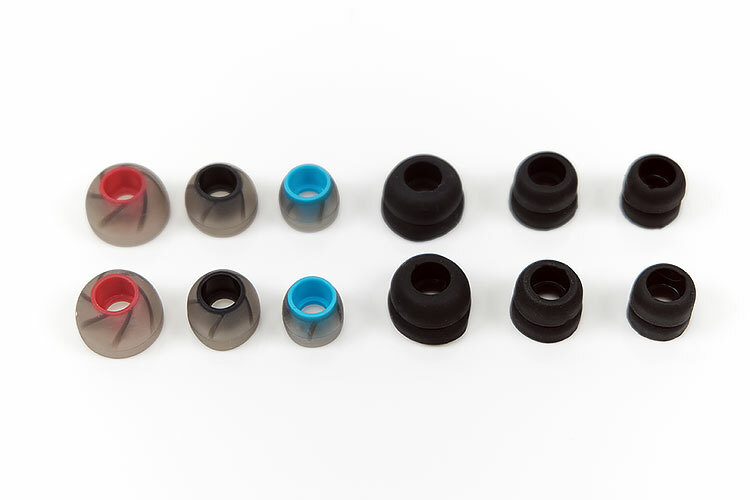 Jomo Audio has supplied two types of tips with the Trinity and both are silicone. The first is their silicone single bore Tennmak Whirlwind tips and the second is a generic black dual flange wide bore silicone set. Both sets come in small, medium, and large. I did not find a huge difference between the two supplied tips when it comes down to how much passive noise isolation they deliver. Perhaps a slight edge to the dual flange tips but given the slightly more open sound of the Whirlwinds, I opted to stay with them. Since this was an advance demo unit I didn’t get the full retail packaging so I can’t tell you how spiffy that box is in the hand though I can show off some supplied pics from Jomo Audio. Given the quality of their packaging of late, the Trinity does not lose out. Jomo has really upped their game in terms of professional-looking retail displays and the Trinity may be their best yet. 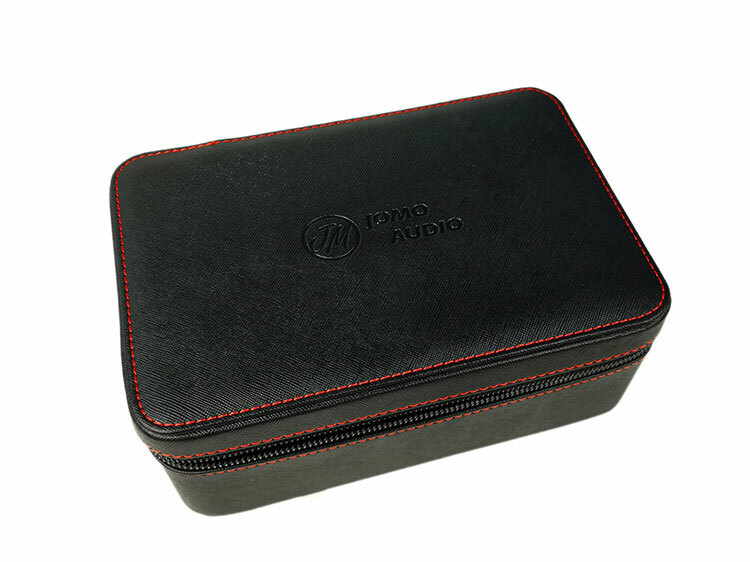 Inside the black retail box, you get a lovely red stitched leather finished zipper carry case with Jomo branding. Inside you get a very neat layout of the monitors, a smaller matching round leather case, cable and accessories. You also get a matching premium leather cable tie and leather warranty card holder. It is all rather fancy and leathery, isn’t it? The retail package also includes a really nice premium Italian Buttero Veg tan leather carrying case which I find quite classy from the pics. These carry cases are not that pocket-friendly but they are big enough to squeeze in the monitors, tips and one, maybe two 4-wire cables or one 8-wire aftermarket.